This 1/2″ wide Platinum Love Ring with .75ct Princess Diamond sold for $6.400. A wearable art treasure made of Sterling Silver on Copper attached to a Santa Fe Braided leather cord $850. Silver hand engraved Hiatsk Shield Pendant on heavy braided leather cord $650. 14k gold on silver Hummingbirds and Rose Gold Flower 11/4″ wide by 6″long by 1mm thick price: $2600. 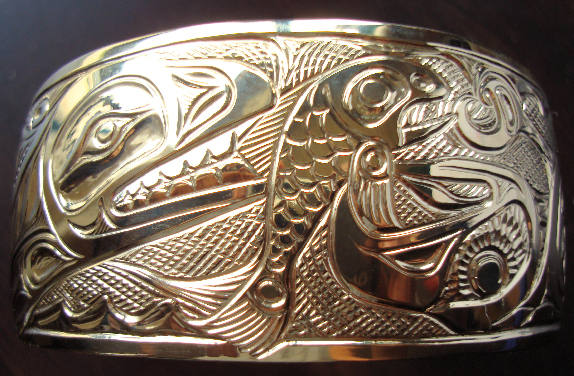 Potlatch bracelet 11/2″ by 6″ hand engraved with many animal crests in Silver Price: $1200.